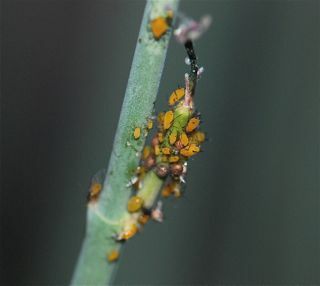 Oleander aphids, Aphis nerii, are bright yellow and black insects found feeding both on oleanders and various species of milkweeds. Interestingly, both milkweeds and oleanders are poisonous. 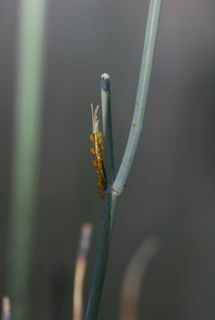 See if you can notice something about the next few pictures of oleander aphids on our desert milkweed. 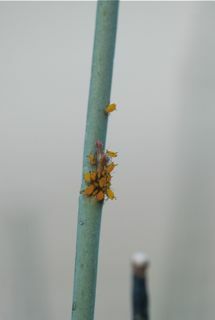 Both my son and I noticed right away that the aphids are all crowded on the new growth, which is rather reddish in color. The coppery brown circles towards the bottom of the colony are mummies. Inside the mummy the wasp pupates. Eventually the adult wasp cuts a hole through the mummy and emerges into the world. 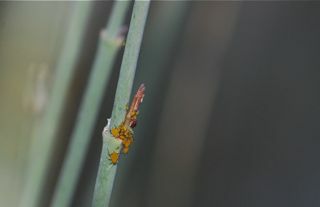 Although usually merely regarded as garden pests, aphids are actually interesting creatures, They are also food for a number of different forms of wildlife. 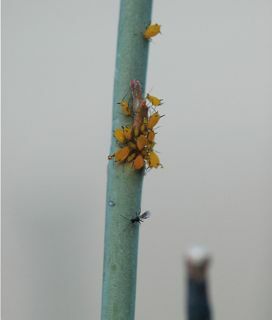 I leave these aphids alone because I know that the wasps, lady beetles and flower flies that feed on the oleander aphids will also feed on any other aphids drifiting into my garden.